I thought I would do a quick post about one of the many things that I love about being a bit “redneck.” Every fall, hunting season creeps in and my family creeps out to go shoot things. We hunt both big game and small game, so many different species of critters run through my kitchen. Although there is no season for them where I live, Western Gray Squirrels are an invasive species and can be harvested at any time with a small game license. This means that these little suckers are targets of opportunity when hunting. I will spare you the gory details regarding the skinning and cleaning, but will mention this. You have to be very careful when cleaning a squirrel or you will get hair all over the meat and it is very difficult to get out. The easiest way to clean them is what I call the “split skinning method” where you literally split the animal’s skin in half and remove the hide off the ends of each side. Just do a Google search and there are plenty of videos that show how to clean a squirrel. 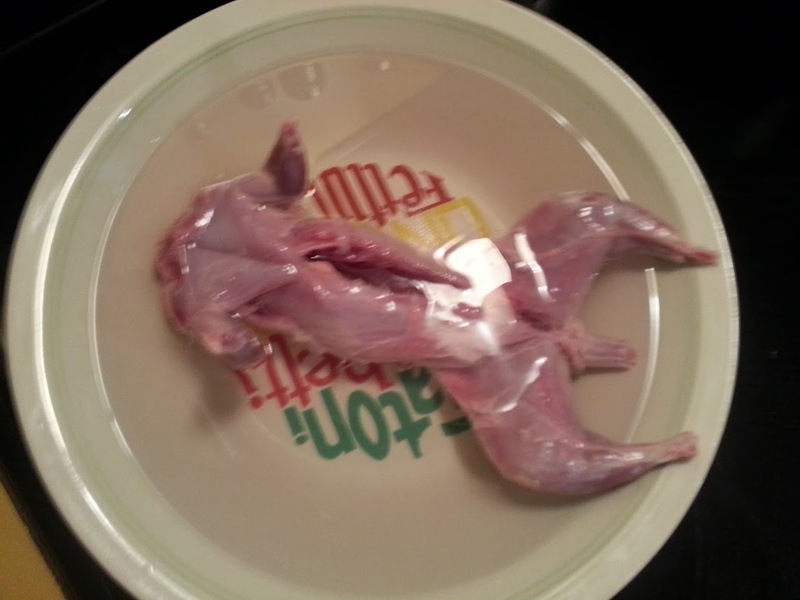 What I like to do after that is soak the squirrel in salt water. It takes all the odd flavors out of the meat. If you get one in the spring or summer you might need to use a bit of apple to soak it in. When in the hills, I keep powdered apple cider with me and just soak it for a few hours in the cider and salt mix. Once cleaned and soaking, it should look like this. Notice how you can see the muscle striations? If you don’t do something to tenderize the meat it will get a bit stringy and tough. When I cook it in the woods I tend to smoke it first then take the meat, cut it up and then finish cooking it in a Dutch oven with a bit of water and soup base. If I don’t have that option due to no Dutch oven at that time, I will just use a squirrel cooker or such and try to cook it really slow. I have found that cooking a squirrel too quickly over flame makes it so chewy that you couldn’t even stick a fork in the gravy. At home, when I smoke it, I use a dry rub of garlic, salt, black pepper, red pepper, and sage. If you have not over cooked it (like I accidentally did for this picture – DOH!) it will be quite juicy and have a great flavor. Don’t forget to do the rub on the entire squirrel or you will get a bit of a tasteless treat. 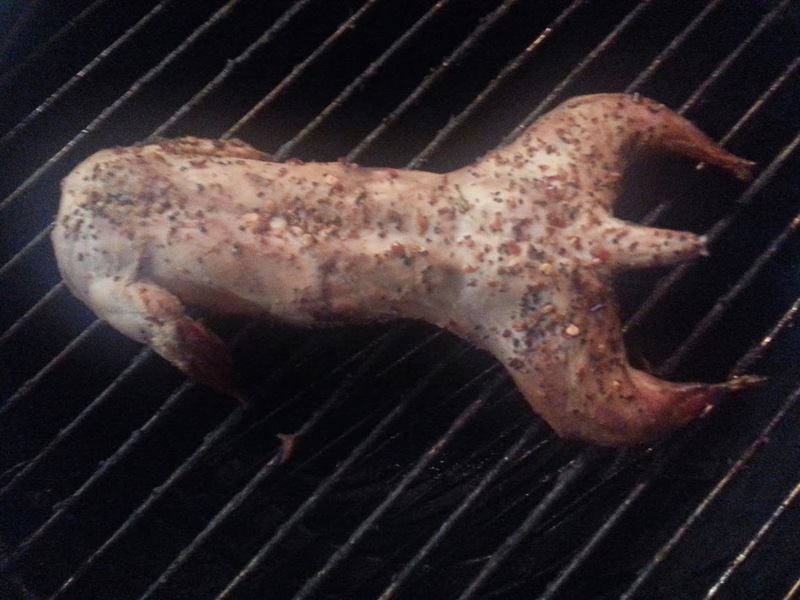 You can cook many of the rodent type small game animals this way such as rabbit and raccoon. Raccoon really needs some time boiling in apple though. It helps to get the greasy film and flavor off the meat before you cook it. Next time you are watching the squirrels bounce around you and you feel that rumbly in your tumbly, go ahead and bag a couple of those tree rats. With some care and decent cooking skills your day out of seeing nothing can turn into a day out with a good snack involved. This entry was posted in Camp Techniques and tagged squirrel cooking, squirrel cooking tips, squirrel for dinner, squirrel hunting on September 29, 2014 by Woodsbum. I get a lot of questions about hammocks and how to get everything properly set up. Well people, this is the guy that I modeled everything after. Of course I made a few modifications to meet my needs. Overall this is really the best all around configuration to start with. When you are done with the first one, just click through all parts. You should also check out his YoutTube channel. He is really a wealth of information. This entry was posted in Camp Techniques, Hammocks and tagged camping, hammock camping, hammock suspension, hammocks, setting up a hammock, suspension on September 26, 2014 by Woodsbum. I learned through experiencing all the tough times we lived through in Wyoming that we needed to put supplies back. We lived in Casper when the bottom fell out of the oil industry. There were times when I we were forced to shoot deer or antelope to feed ourselves. My father ended up working all sorts of odd jobs for cash and trade just to keep us from being homeless. During trips to the grocery store I distinctly remember families trying to figure out how to feed their family and mothers crying in the isles because there was not enough money to get everything that their family needed. It was horrible, but I learned a lot from both living it and from all our Mormon friends who seemed to have everything they needed. The LDS church there in Casper had all their members put back at least 1 year supply of food and daily necessities. Their ability to make it through this time when no one had money or a job really struck a nerve and made me realize the brilliance of this lifestyle. Now let’s fast forward enough years that I will not admit to a specific number…… I have really put what I learned in Wyoming to good use. We keep all sorts of things stored up in case we need something and can’t just go to a store and buy it. As our stockpiles of “stuff” grew, I realized after watching the news that having a way to protect the bodies of my loved ones was not a bad idea. This was when I decided to just bite the proverbial bullet and buy some body armor. Now here is the problem. This stuff almost requires that you spend a substantial amount of time just to be educated enough to buy yourself something. It is actually quite complex. Features that allow you to move the armor out of the way for medical access, rip cord things to drop the armor if it seems to be dragging you down while swimming, MOLLE vs laser cut attachments, polyethylene vs AR500 steel plates, ceramic plates, protection levels, price, color, fit, padding, whether Venus is in Scorpio during a full moon… The list goes on and on. It is seriously crazy. To help myself and to help you readers, I am going to pass along a few things that I have learned thus far and point you toward the items I plan on purchasing next week. Plate Carrier – This is simply a vest that allows bullet proof materials to be inserted into pockets or under the liner to make your vest bullet proof. Plates – Plates are the bullet stoppers for rifle calibers. There are various types, but just know that anything that looks like a rectangle or rectangle with the edges trimmed off the top is called a plate. Shooter and Swimmer Cuts – See the definition of “Plates” above? The cut off edges allow for you to “shoot” or “swim” depending on how the cuts were made. If you didn’t cut the edges your arms would be hitting the plate and getting all messed up. Soft Ballistic Panel – This is the soft version of a plate, but doesn’t stop the bigger things shot at you. NIJ Level – There are several “Levels” of armor. You might even see NIJ CTP and then a number. These numbers reflect what size bullet and caliber that the ballistic material will stop. For example, you need III to stop rifle bullets. IV means it will stop some AP (armor piercing) rounds. IIIA means that it will stop almost all pistol rounds….. Do yourself a favor and check a chart. Just those terms alone will help you enough to start looking around. Just know that a plate carrier is USUALLY not made of a ballistic material. In another words, your plate carrier needs inserts or plates to stop a bullet. Otherwise it is just a very expensive vest that isn’t very fashionable. So the first step you need to do is decide upon “soft” or plate armor. I have not done too much research on soft armor other than lifespan. You will have to eventually replace soft armor. It only lasts for a finite amount of time due to fiber breakdown from heat and moisture. Since I want it to stop rifle calibers, this was an easy choice for me. I may get some soft armor later on for concealment reason, but at this point I am just getting something that will save my bacon if shot with an AR or AK. The next step is to look at your bank account (and in my case cry a little) to decide how much you want to spend. The plates are going to really eat up a good chunk of your budget. AR500 plates are the cheapest and cost around $100-$200 per plate. Sometimes you can get package deals where you get front, back, and side for around $250-$300. This is on top of the plate carrier cost so a simple setup will run you around $400 as a baseline cost and can go up from there. If you go for the polyethylene plates that are much lighter and float, you can see prices around $400 for a single plate. Ceramic plates seem to be all over the place in price from $350-$500 per plate. Either way you are doubling the cost of your armor if you use anything other than the AR500 steel plates. Lastly, look at the attachments and accessories that you can get for your system. There are all sorts of different items that can Velcro on such as ballistic shoulder/arm protection, ballistic groin protection, ballistic neck protection, shoulder straps, magazine pouches, bags, holsters, the kitchen sink…. All sorts of stuff is available for your pack animalistic pleasure. The price and strength of your legs to carry everything are the only restrictions. Ironically, the hardest part of the whole body armor purchase has been finding a plate carrier that will be big enough for me. I suspect that most people will have similar issues finding something that fits comfortably. My problem is that I am tall and big. We are talking about someone the mid-sized professional wrestler. Most products I find are too small around the chest if they fit my waist, are too short, or are too big around my waist to fit my chest. There is little middle ground with products so sizing me is always difficult. Since we are talking about carriers that can range between $70 and $700 for those that I looked at, just to get one in for size comparison is an expensive proposition. I think I have found one that will work and isn’t too crazy in price. If it works, I will post about it when I get it. Now, I am not sure how many of you can get a chance to find a vest to check its size. I have been trying to figure that out myself. My best guess would be a LEO outlet or trade show, but I am not sure how that stuff works. I am basically checking YouTube and crossing my fingers. This will run me about $400 for the set. It will also be about 25-30 lbs of weight. I guess my rear end needs to get less weight lifting time and more cardio to carry this crap. No matter what, I will show you guys what I have picked up when it comes in as well as my thoughts on it. I will not, however, go shoot it and see what happens. There are more than enough videos online that destroy these expensive plates. Good luck people and I hope none of us actually has to use this stuff. This entry was posted in Emergency Preps, Miscellaneous and tagged AR500, body armor, bullet proof, bulletproof, plate carrier, vest on September 24, 2014 by Woodsbum. A while ago I ran into a very neat little product called the Arrowcard. 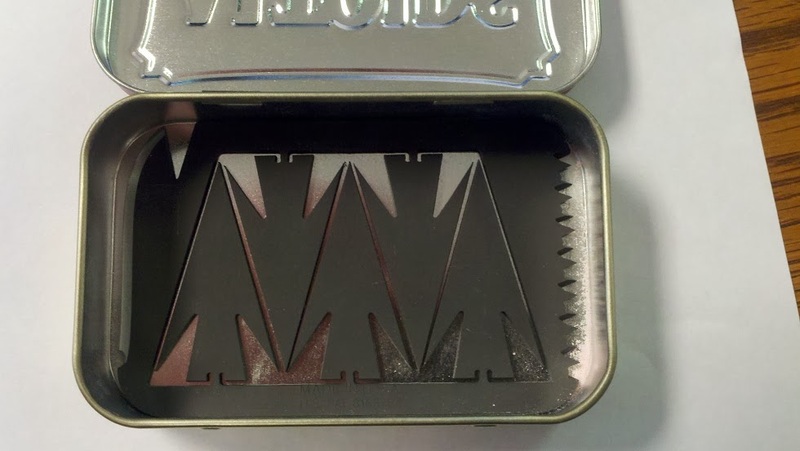 They come in several different configurations to include a dogtag style and a card style that fit into the bottom of a tin, such as an Altoids tin. In essence, these little cards are multi-tool devices that incorporate an actual arrow/spear head into the card. Being the tinkering type individual that I am, I had to get myself several of these little gadgets to play with and see how they worked. All in all, I ended up getting numerous more and have them laying around the house now because I can’t break them, lose them, or wear them out. Way to go Primalware! 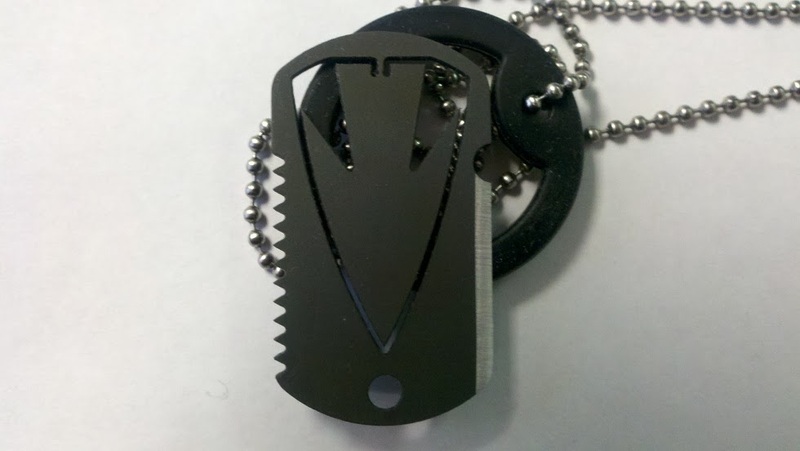 Here is what the dog tag style look like. The tags were around $15 when I got them and included a silencer and chain with the tag. What I did was make them into necklaces and gave them out to my family. 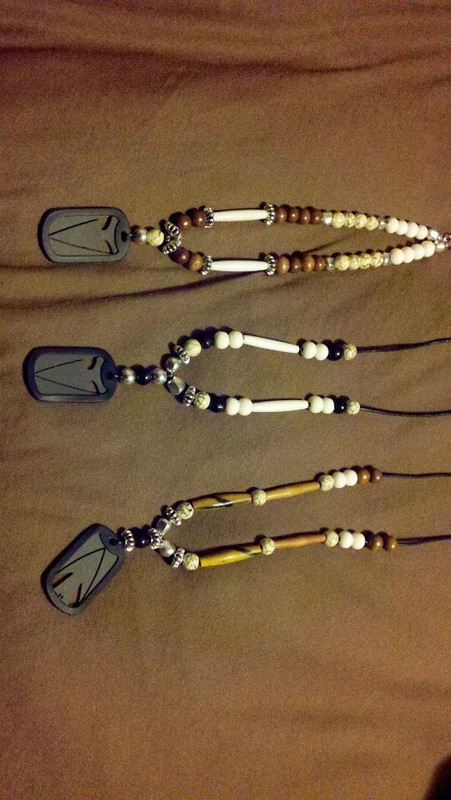 These are the way that the necklaces looked when I was done with them. Th tags have the arrow head that pops out and can be used as either a broadhead or as a spear/javelin tip. The sides of the tag are either sawblades or knifeblades and really work well considering that it is a dogtag that you are cutting with. The arrowcards are a bit bigger and are easier to use. I got one that fits into an Altoids tin and one that fits into a larger tin. They also have different type tips. One is multiple arrow heads and one is more of a spear with a frog/fish gigging tip and arrowheads. I have played with these a bit and have used them for general tasks. Considering the fact that they cost money, I have not ripped one apart just to play with it. 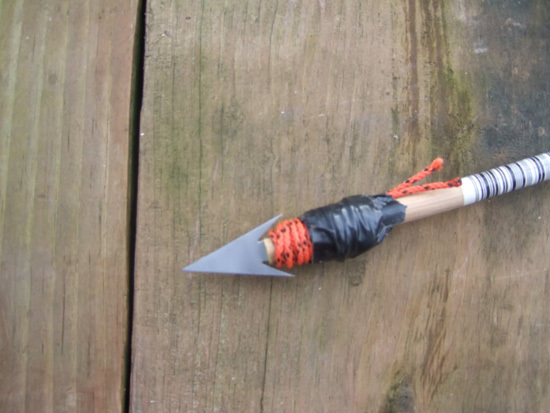 Lucky for me, there is a picture online of someone that used the arrowhead as a broadhead on an arrow. After having had these floating around in my pack, truck and around my neck for a couple years I can tell you that they are quite handy. The quality is very good. And I have no doubt that they will be capable of fulfilling their intended purposes. The knife edge on my necklace and card in my Altoids tin have seen quite a bit of use. The one in my tin as even been used to clean a couple rabbits and grouse. 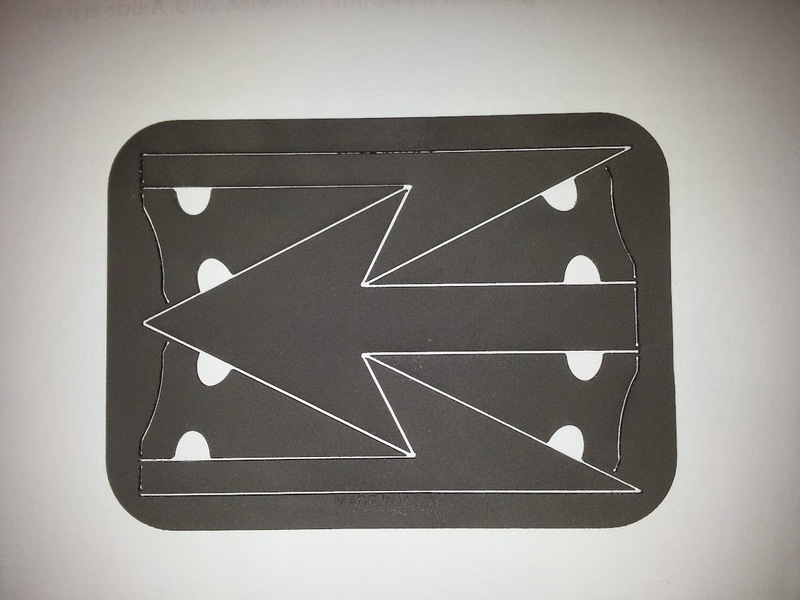 This entry was posted in Edged Tools, Miscellaneous and tagged arrow card, arrow head, arrow head dogtag, arrow tag, arrowcard, arrowtag, primal wear, primalware on September 22, 2014 by Woodsbum. For many years, I have carried some form of compact semiautomatic pistol. Originally, it was a Glock 30 (not very compact, but small enough to carry and pack a punch). After I found that the Glock was too big for my liking, I moved over to an old Smith and Wesson SW9. Eventually the firing pin spring wore out and the factory replaced it with a M&P Shield. Now, I still carry this quite often. There is a problem with the size of this pistol, however. It is nice and compact compared to most pistols, but it still tries to pull my pants down when I wear workout clothes and still tugs a bit in a cargo pocket. I was to the point where I was actually getting annoyed. 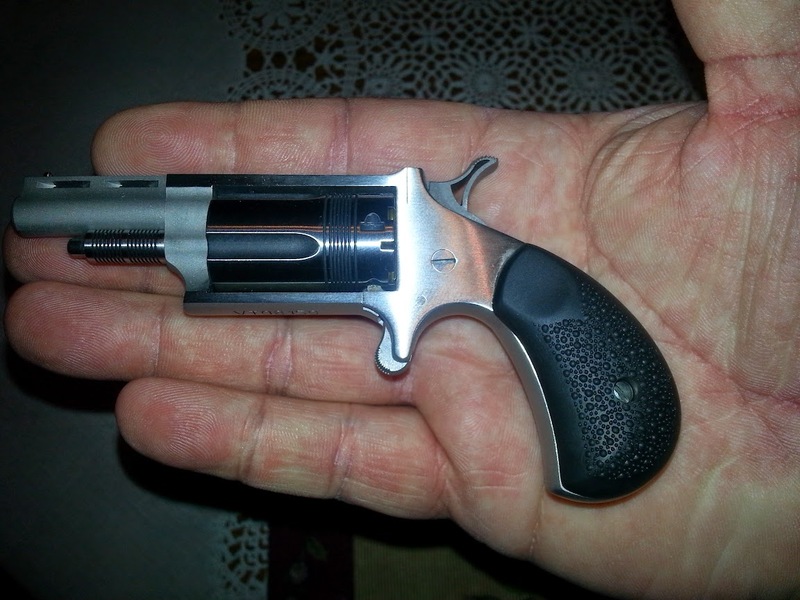 This little guy comes with two cylinders so that I can shoot either .22LR or .22WMR ammunition with it. The cylinder comes out by pulling the pin under the barrel. This is also how you reload it. The design does not allow for reloads while the cylinder is still in the frame. 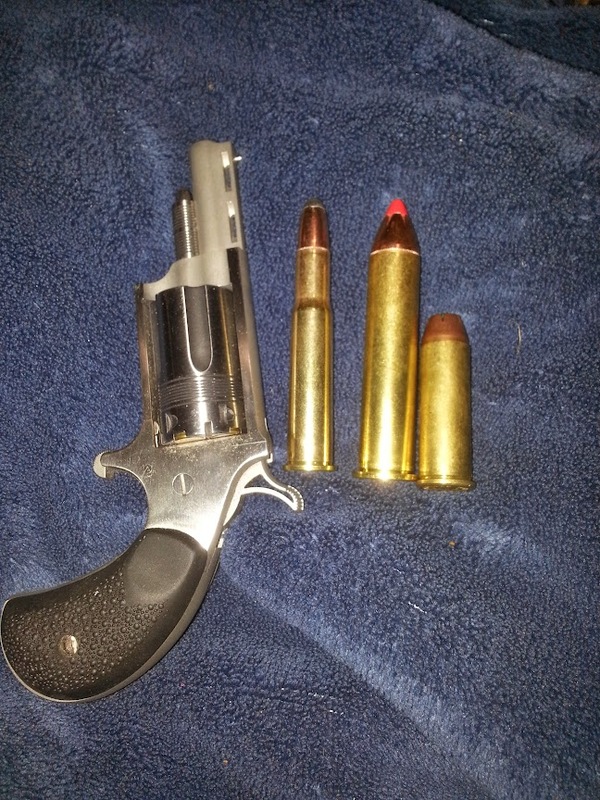 For a better frame of reference in regard to size, here is my Wasp pictured next to a 30-30, a 45-70 and a .44 mag cartridge. As you can see, it really is not much bigger than having a set of truck keys and work keys in the same pocket. The design also makes is safe to carry the cylinder completely loaded. There is a notch between the rounds that the hammer fits nicely into. This locks the cylinder and prevents accidental discharge of the pistol while bouncing around your pocket. I have always been an advocate for carrying any firearm with an empty chamber, so this feature really struck me as well thought out. I do carry revolvers with all chambers filled, but put the hammer down between cartridges in a similar manner. This design locks the cylinder and disallows the pistol from accidentally rotating to an unspent round. Very nice job, guys! Now for how it shoots….. I am not as spot on with a camera, so I never remember to take pictures of my targets after I shoot them. This may also be due to the fact that I usually don’t use paper targets when plinking. Either way I am stuck just telling you how it performs, so if you want to see actual “proof” you will have to find one to play with. With the .22 WMR rounds, it was dead on accurate. Where the pistol was pointed was exactly where the round hit. The sights are similar to how you aim a shotgun for there is no rear sight. You basically put the bead on your target and let ‘er rip! Using Mini-Mag .22 LR also resulted in the same accuracy. I was shooting Dr. Pepper and RC cans at 25 yards with this little guy….. Then came the standard velocity rounds. Oh, boy. I would have been better just throwing the rounds at the cans. It didn’t shoot a grouping, but more of a pattern. It was a pattern of a drunk, blind person wearing mittens. It was HORRIBLE. I used Remingtons, Winchester, CCI and Federal standard velocities in several different grain weights. Nothing worked to pull the accuracy back into a grouping but the CCI Mini-Mags. I did not try Stingers. Mainly because I didn’t have any. The NAA pistol is really a great pocket pistol. With the right ammunition it is very accurate and .22 WMR is truly no joke round. There are also many accessories for this little guy to include flip handles with clips and belt buckle mounts. Considering the price and fact that this little guy gives you the ability to carry even when working out, swimming, or wearing anything that will disallow normal concealed carry without printing, NAA has got a real winner. I consider this one of my best firearm purchases and am now recommending that all my friends get one. This entry was posted in Firearms and tagged 22 pistol, 22lr, concealed, concealed carry pistol, mini revolver, NAA, North American Arms, pistol on September 19, 2014 by Woodsbum.